Inter Aide : Good morning sir, thank you for taking time to answer our questions. We are workers from Inter Aide and we come to learn more about your bleach business. Mr Kalabaty : No problem, thank you for coming. IA – First, can you tell us when you started this bleach business? Mr. K. – Let me check in my book. He goes inside the shop and comes back with a notebook. I started in March 2016, ten months ago. IA – And why did you start this business? Mr. K. – Inter Aide first came to see me and talk to me about this bleach business. Before, I only knew chlorine for laundry, I didn’t know it could be used for drinking. Inter Aide gave me 10 bleach bottles and 4 syringes free to sell as a starting kit, and then I went to the supplier to refill. They also gave me this notebook and a pen. IA – And did you receive any kind of training by Inter Aide at the beginning? Mr. K. – Yes, they explained me how to record bleach sales in my notebook and how to treat water with chlorine. IA – Would you be able to explain us how to treat water with chlorine? Mr. K. – No problem! When you want to treat water with chlorine, first you wash your hands. Then you use a white cloth to filter water, and after filtration you turn it back into the container. Then you take the syringe, you pull 2 mL of chlorine that you put in the container, you shake it and after 30 minutes you can drink. All the steps are explained on the poster that they gave me and that I pasted on this door. IA – Nice! And do you often have to explain those steps to your customers? Mr. K. – No, almost never. All customers who come to buy bleach already know how to use it. IA – Who is your bleach supplier? Mr. K. – I refill at Foday and Fofanah pharmacy in Makeni, it is the supplier that Inter Aide recommended. He shows us the card. I go there every two to three months. IA – How much do you buy the bottle there? Mr. K. – I used to buy it 5,000 Le [NDLR: about 0.66 EUR]. But recently the price increased to 6,000 Le because of increase of price of fuel. IA – And how much do you sell the bottle in your shop? Mr. K. – We have an agreement with Inter Aide, I have to keep a low profit so that chlorine remains affordable for the communities. When I buy the bottle 5,000 Le, I sell it 6,000 Le. When I buy it 6,000 Le, I sell it 7,000 Le. IA – And how many bottles do you sell every month? Is it a good business for you? Mr. K. – I have sold 24 bottles in 8 months, only 24,000 Le profit! It is not a good business! IA – So why do you continue? Mr. K. – It is not a business for profit! I do it to help people in the villages have pure water for drink. The business is small on profit but big on the other hand. I really appreciate this business. Let the people be healthy. IA – And how much do you sell the syringe? Mr. K. – I sell it 1,000 Le each. IA – Have you ever had issues with the supplier in Makeni? Mr. K. – Except the fact that the price increased recently, no, I have never faced any particular issue with Foday. IA – And how do you manage for transport to go there? Mr. K. – The capital from the bleach business is not enough to pay transport for itself, so I buy bleach when I go to Makeni with my personal bike for other purposes. I can also send somebody who would go there for me using this card. IA – Have you ever experienced shortage in your shop? Mr. K. – Only once, I had a 3 days shortage between the last sale and the refill. But most of the time, I try to refill before the balance drops to 0: when I have 2 bottles left for example. IA – And today, if I want to buy a bottle, you have some in stock? Mr. K. – Yes, I do! I refilled recently, I have 12 bottles currently in my shop. And I also have 2 syringes. IA – May we see where you store them in your shop? Mr. K. – No problem. Come in. I keep them here, so that the children can’t reach them. IA – Do you know which communities are supposed to buy bleach in your shop? Mr. K. – Yes, Inter Aide gave me the list of the communities supposed to come when I started: One house, Gubayama, Nerehun, Mahindie, Mabaina, Magbankaba and Kagbegbeh. They all effectively come, every 2 to 3 months. IA – And all the communities who buy bleach are the ones that have been trained by Inter Aide, or do you have some other customers? Mr. K. – I think only communities from Inter Aide come to buy bleach. They all come with the card that Inter Aide gave them with the address of my shop. IA – Do you know other resellers who also sell bleach? Mr. K. – IA gave me with the contacts of all other bleach resellers in the district; the sheet is pasted in the notebook. For example, Umoro Shall in Kamaranka is not far away from here. If I have any issue with this business, I know that I can contact him to ask for help. They also gave me a laminated map, but I did not paste it in my shop yet! Look at my picture on the map! IA – A more personal question now… Do you personally treat water with chlorine? 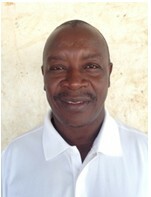 Mr. K. – We are lucky to have a hand-pump in Laminaya where we fetch water for drinking. But I do put chlorine in my private well! IA – Globally speaking, what are the major issues you are facing with this bleach business? Do you have any idea of how we could improve it? Mr. K. – As the communities only buy once every two or three months, the business is very slow, and the transport costs are high for a small profit. You should increase advertisement for household water treatment so that more communities come to buy bleach in my shop! This entry was posted in Household water treatment on July 20, 2017 by Mathieu.